In regards to Feng Shui, the water element is said to enhance the ability to go with the flow. The Koi fish on the other hand are known for their strength and ability to swim upstream, through waterfalls and other obstacles reach their destination. The new Koi collaborative desk from Paragon is just that, durable classroom furniture that can power through various streams of curriculum throughout the workday. The unique shape mimics that of a fish and nests easily among other Koi desks. Create pods, rows, or use individually during independent lessons. The 3/4″ thick tops have ample workspace and are available in two sizes: 20″x30″ or 24″x36″. While their tops may seem new to you, the frames may seem familiar as they are part of the A&D line from Paragon. The flattened oval legs are adjustable from 24″ to 34″ high using a patent-pending, plastic-molded bezel sleeve with 8 contact points to securely set the leg at your desired height. Like koi fish, these desks are colorful and come in several pleasing options that range from bright Orangesicle, to calming Cloud Nebula. The student desks come with color coordinated backpack hooks and the legs are also accented in your choice of color. Option add-ons include either a steel or wire bookbox that can be installed underneath the desk top, and wheelbarrow casters. Wheelbarrow casters simple means that only two of the four legs would have casters, making the desk mobile like that of a garden wheelbarrow. If you are looking for an updated 21st century classroom, that keeps the attention of both students and educators alike, then the Koi collaborative desk is up for the challenge. 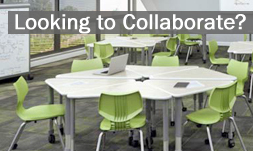 For other ideas on how to modernize your classroom, check out our complete online selection of collaborative desks.